2) It is great to know that fresh local seafood can still be had. It is a lot of fish, and this concerns some about the future of wild caught seafood. Humans have been harvesting wild caught seafood since the beginning of time, or at least as far back as boats go. What has changed today is better technology and more fishermen on the water. With these issues in mind, you have to either (a) reduce the number of fishermen on the sea, or (b) reduce the number of fish harvested. Though not always popular, this is where fisheries management comes in. 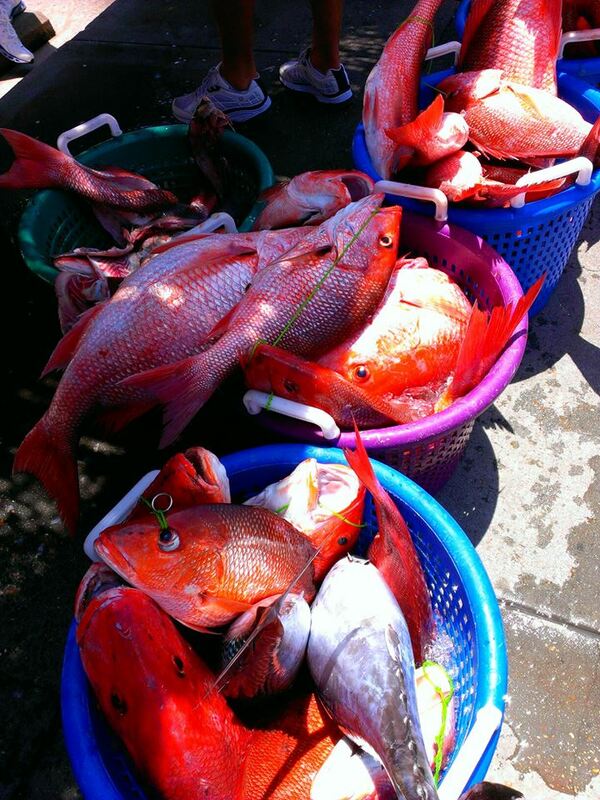 Commercial seafood is a large part of Florida’s economy and culture. The basic idea is to allow each species a chance to breed at least once before they are harvested. The Magnuson-Stevens Act, passed in 1996, requires that commercial fisheries within U.S. territorial waters be sustainable – meaning viable into perpetuity. To do this you need to know the life cycles of your target species. At what age do they become sexually mature and begin breeding? The age of a fish can be determined by rings in the otolith (ear bone) and there is a correlation between the number of rings and the length of the fish; hence the length regulations many species have. You need to know at what age they reach maturity, you allow one (sometimes more) years beyond this age allowing them to breed. The next metric is how many of the mature adults can you allow to be harvested and remain sustainable. This obviously takes a lot of fisheries biology, and there are researchers at the federal, state, and university levels who work on these questions. When you know the answer to some of the biology questions, you can now input this into a computer model and determine what is known as the maximum sustainable yield, or how many fish (or the number of pounds) can be removed and still be sustainable. Computer models are only as good as the programs that are developed for them. These can be hard to test. Hurricane computer models have become pretty good. Everyone remembers when Michael was approaching the Pensacola area and the modelers were sure it would make an eastward turn; and it eventually did. The thing about hurricane models is that if they are not working well, you know relatively quickly. Hurricane approaches shore – computer predicts where it will go – it makes landfall somewhere else – you correct the model – we get better. With fisheries, and other issues, we do not always get feedback as quickly as this. Stock assessments for selected species have to be made to see how the models are working, and this takes time. Though it may not be an exact science, fisheries management certainly has helped hold on to some species that would have been harvested out otherwise. 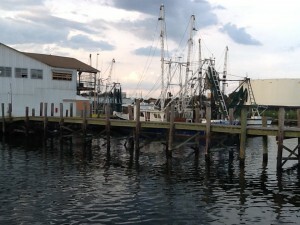 There are about 80 species of commercial seafood products that come from Florida. As far as knowing local seafood is still available, this is good news for many. Checking in with your local seafood markets you can find a variety of species at different times of the year. Some provide information as to which local restaurants they sell to. Many locals, and visitors, are willing to pay a higher price for these sought-after seafood species. It is good to know you can still get them in our area. Oyster grow bag left hanging by Michael’s storm surge. It may be a long time before the memories of Hurricane Michael begin to fade in the mind’s eye for residents of the Florida Panhandle. A record-breaking tropical cyclone in many respects, Michael caught a lot of people in the region off guard as it continued to gain strength on its rapid path through the Northern Gulf of Mexico. When many people went to bed the night before landfall, they had no idea what terrifying news would greet them upon hearing that a still-strengthening category 4 hurricane was about to rumble ashore. It was not long after the wind slackened that folks began looking around and realizing the devastation left behind. Cotton crops in the path of the storm in North Florida and South Georgia suffered near 100% losses. Peanut crops were also severely impacted just at the time that harvest was beginning. The estimated damage to timber harvests alone were coming in around 1.3 billion dollars for Florida as virtually entire forests had been leveled. Even more damage was realized near the coastline where storm surge across the region ranged from 8 to 14 feet above normal water levels; smashing or flooding structures near the coast and carving new inlets across St. Joseph Peninsula near Cape San Blas. Another industry that took a hard hit in much of the area was the seafood industry; everything from the producers to the dealers, processors, retail markets, restaurants, fueling and ice house facilities that service fishing vessels. 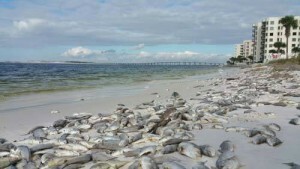 Governor Scott requested a fisheries disaster declaration from the Federal Government and on November 1 the Secretary of the Department of Commerce granted the request. This determination provides an opportunity for Congress to appropriate fishery disaster assistance for the new fiscal year, which began in October. To further facilitate recovery efforts in Florida and beyond, the Department of Commerce can look to the Economic Development Administration, which spearheads the Federal government’s efforts to deliver economic assistance and support long-term growth after natural disasters. Oyster growers in the region who had equipment and a crop of shellfish in the water took some losses as well. For those who were able to scramble to their leases before the storm and sink their floating baskets or cages to the bay bottoms, losses of gear were minimal as storm waves above the submerged gear had less impact. Gear that was unable to be submerged was more prone to break loose and drift away. However, even the growers that sunk gear experienced some significant oyster mortality due to sediments from churned up water smothering the shellfish in a layer of mud. Shellfish leases in Alligator Harbor were dealt another blow by an incredible field of debris that was washed off Alligator Point and blown through the lease area. Everything from boats to large sections of docks, structural walls, refrigerators and freezers was in the mix. These items were caught up in oyster long-lines and broke some while pulling up anchor poles on others, leaving quite a mess for growers to untangle. Marinas, docks and vessels were also not immune to Hurricane Michael’s wrath in Gulf and Bay Counties. 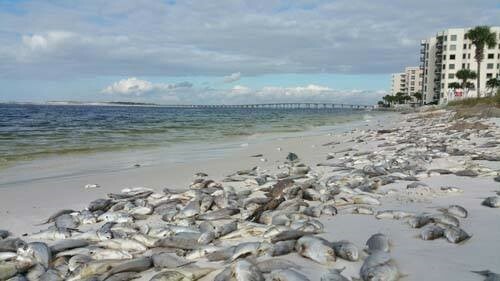 Government agencies estimate the number of damaged vessels in both Gulf and Bay counties to exceed 400. It will take some time for charter boat and commercial fishing operations to rebound. Scallop restoration projects in both St. Joseph Bay and St. Andrews Bay have suffered setbacks, as well. The hurricane has not only devastated coastal Gulf county economically and ecologically, but also geographically. There are two sizable inlets that have now been carved into the St. Joseph Peninsula. T.H. Stone State Park is closed until further notice. Overall, the impacts from this storm will take a long time to recover from for many segments of our regional economy. Lessons learned by industries as well as individuals should improve our chances to reduce the loss of life and property in the future. The name of the game is “resiliency,” both in the spirit of the people who call this place home and in the way we learn to better adapt to what Mother Nature throws at us. Hang in there. Day by day. 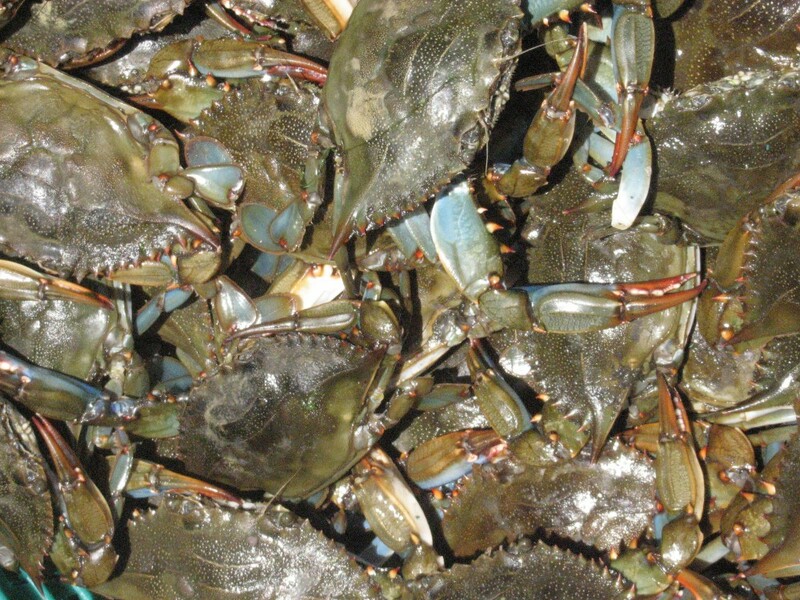 Most kids who grew up on the Gulf Coast grew up catching blue crabs. These animals are common along our shorelines, relatively easy to catch, and adventurous because they may bite you. I caught my first one in 1965 and we proudly displayed the boiled shell over the kitchen bar for many years. This is also a popular seafood target with an estimated commercial landing value of $56,950 in the Pensacola Bay area in 2017. Blue crabs are one of the few crabs with swimming appendages. But who is this crab that we enjoy so much? What do we know about it? As you probably already know, it is one of an estimated 30,000 species of arthropods we call crustaceans. Crustaceans differ from insects and arachnids in that they have five pairs of legs and two sets of antenna. Insects typically have a head, thorax, and abdomen – however, in the crustaceans the head and thorax are fused into what is called a cephlathorax and covered with a section of the shell called the carapace. Like all arthropods, their body are completely covered in a chitinous shell that serves as their exoskeleton. This exoskeleton must be periodically shed (molting) so they can continue to grow. Crustaceans tend to molt about 10-11 times each year and typically in the summer months. To molt, crustaceans will remove some of the salts and minerals from the shell into their tissue, this weakens the shell enough to separate it. The crack is usually between the cephlathorax and abdomen. When they emerge, they are completely soft and about 30% larger than before – it is amazing to see this large crab emerge from the small shell it once lived in. Because of the softness of the body after molting, this is usually done under the cover of darkness for protection. The salts and minerals it removed during pre-molting are now used to harden the new shell – which can take a couple of days. It is at this stage we call them “soft shells”. 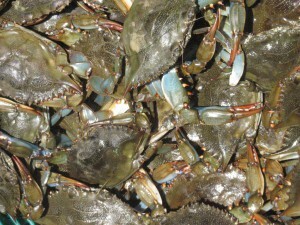 The crustaceans include many different kinds of arthropods – most notably are the crabs, shrimps, and lobsters. There are over 4500 species of crabs and they differ from shrimps and lobsters in the fact their abdomen flexes beneath their body – you do not see the “tail” you see in a lobster or shrimp – but its there. Crabs can also move very well laterally, which their cousins are not so good. Blue crabs differ from other crabs in that their last pair of legs are modified as paddles and the animal can swim. They can swim forwards, backwards, and laterally – and they are often seen swimming at the surface. There are other crabs who have these swimming paddles and they are all called protunid crabs. 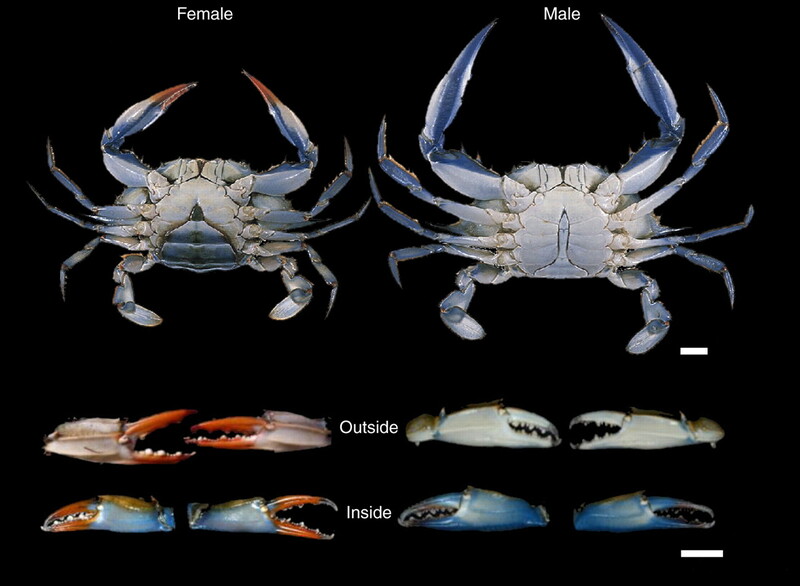 Blue crabs perceive their world through their eyes, antenna, and sensory cells on their body. They are very good at burying in the sand – eyes and antenna exposed – and sensory cells all working – seeking prey and avoiding predators. Their eyes differ from ours in that they have numerous lenses, compared to our single one, and are called compound eyes. Each lens does not provide them with an image of you or me however. Rather each lenses provides them with a single pixel of light. It is much like the image you see on television when they are trying to block out a brand name, or someone’s face. The more pixels (lenses) you have, the clearer the image. Those this type of eye does not give as clear an image as ours; it is very good at detecting motion and has served the arthropods very well over the years. For blue crabs, food can be just about anything. They are active hunters – usually using the ambush method of capture (buried in the sand), but are also known scavengers – eating any bits of food they can find. Those enjoy crabbing know this – you can put just about anything as bait in a crab trap and it works. They have numerous predators including fish, birds, mammals, and sea turtles. Male and female blue crabs. 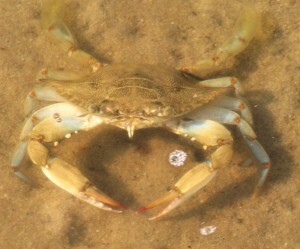 Blue crabs can be found in a variety of salinities (euryhaline). Males are typically found in the lower salinities of the upper bay. Females join them during mating season – which is in late spring and summer. Males cradle the females beneath his legs for several days waiting for the right location and moment to breed. Fishermen refer to them as “doublers” during this time. The females will molt and the male will then deposit his sperm into a sac called a spermatophore – which he then deposits to the female. She will then migrate to the more saline lower portions of the lower bay, while he remains and seeks another female. This may be the only spermatophore she receives her entire life – which can be up to five years, though most do not live beyond three years. She will use sperm from this spermatophore over that time to fertilize eggs. 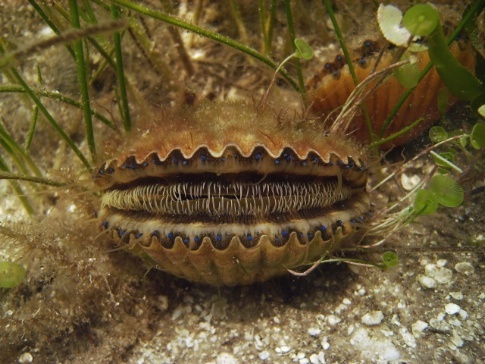 The eggs develop in a sponge mass that develops beneath her abdomen. This egg mass is orange when in early development and becomes a darker brown with age as the larvae consume the yolk. There can be between 750,000 and 2,000,000 developing eggs within this mass. The females are called gravid at this stage and it is illegal to harvest gravid crabs in Florida. The eggs hatch in about two weeks and a small microscopic mosquito looking larvae emerges – at this stage, they are called zoea. The zoea drift into the Gulf of Mexico where they feed and molt. Eventually they return to the estuary and become a microscopic crab with a tail – this stage is called a megalops. The megalops will feed and molt. The tail will eventually flex beneath and the crab becomes sexually mature. The entire process from hatching to sexual maturity is about 12-18 months. These are fascinating animals. 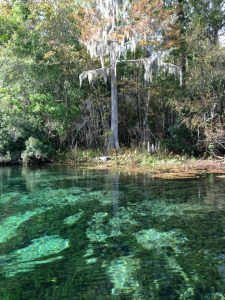 They are very common and a large part of the coastal culture of the Florida panhandle. Kids will have great fun catching them with a hand net, letting them swim in their beach buckets, but be sure to let them go before you head home and watch those claws – they do know how to use them. It is a great animal. 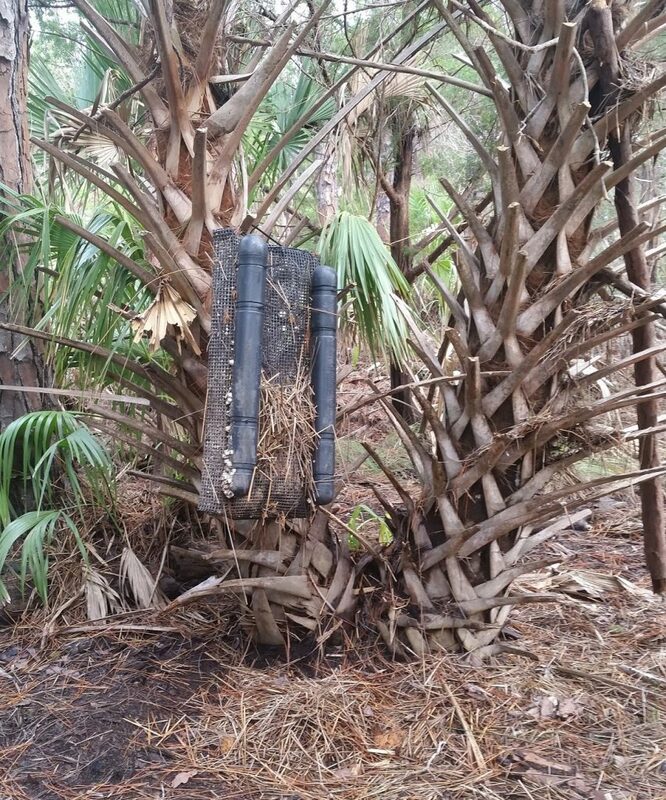 Trap closed season in Florida panhandle – Jan 5-14 in odd years. Barnes, R.D. 1980. Invertebrate Zoology. Saunders College Press. Philadelphia PA. pp. 1089. Blue Crab. Callinectes sapidus. Chesapeake Bay Program. 2018. https://www.chesapeakebay.net/discover/field-guide/entry/blue_crab. Florida Fish and Wildlife Conservation Commission. Commercial Landings in Florida. 2017-2018. http://myfwc.com/research/saltwater/fishstats/commercial-fisheries/landings-in-florida/. Florida Fish and Wildlife Conservation Commission. Recreational Blue Crabbing. http://myfwc.com/fishing/saltwater/recreational/blue-crab/. There is a concern about the safety of seafood harvested from our estuary… sort of. Many local residents and visitors ask frequently about the safety of these products. However, when programs are held to provide this information they are not well attended, and when articles are posted – few view them. I think there is a concern for the safety of seafood products, particularly those from our estuaries – so I cannot explain the lack of interest in the presentations and articles. Commercial seafood in Pensacola has a long history. One contaminant that gets a lot of press is mercury. The toxic form of mercury is methylmercury. This form of mercury impairs brain development of fetuses – hearing, vision, and muscle function in adults. Studies suggests that the primary source of mercury in the waters of the PBS is the atmosphere. Advisories have been issued for Escambia, Blackwater, and Yellow Rivers. There have also been advisories for local largemouth and king mackerel. This is one of the metals whose concentrations within the PBS is higher than neighboring estuaries – especially in our bayous (see https://blogs.ifas.ufl.edu/escambiaco/2018/06/13/restoring-the-health-of-pensacola-bay-what-can-you-do-to-help-bioaccumulation-of-toxins/.) Florida Department of Environmental Protection (FDEP) has issued Total Maximum Daily Loads (TDMLs) for mercury in the PBS. For monitoring purposes, total mercury (THg) is easier and less expensive to than the toxic form methylmercury (MHg). Many believe the amount of THg is equivalent to the concentration of MHg, and so it is used as a proxy for MHg. Both the U.S. EPA and the FDEP recommend concentrations of THg not be higher than 0.3 ppm, and 0.1 ppm for pregnant women (or women planning a pregnancy). Since 2000, four studies have been conducted on six species of fish in the PBS. Concentrations of THg ranged from 0.02 – 0.88 ppm and averaged between 0.2 – 0.4 ppm. Two studies have been conducted since 2007 found mercury concentrations ranged from 0.07 – 1.1 ppm. 30 years ago, studies were finding concentrations of THg in oysters around 0.02 ppm. Repeated studies between 1986 and 1996 found an increase to 0.3 ppm. 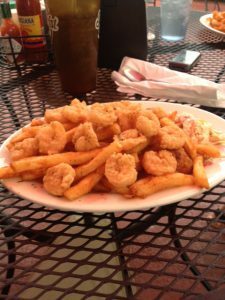 Studies suggest that shrimp and oysters have lower concentrations of THg than blue crab and fish. Seafood has a long history along Florida’s panhandle. 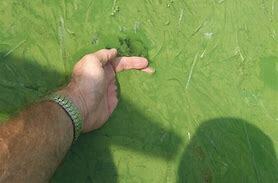 How often have samples exceeded the safe levels suggested by EPA, FDEP, and FDA? The concern for mercury in local seafood has led to a reduction of consuming all seafood by pregnant women – period. Recent studies have shown this can have negative effects on the developing baby as well. The recommendation is to avoid fish that have been tested high in THg. Most of these are high on the food chain – such as king mackerel, shark, and swordfish. You can find the latest on seafood safety and advisories at https://myescambia.com/our-services/natural-resources-management/marine-resources/seafood-safety. Another piece of this story is the belief, by many, that selenium can lower the toxicity of MHg. Many believe that molar ratios of selenium and mercury greater than 1.0 can reduce the toxicity. However, there have been no studies on molar ratios of these elements in the PBS. The bottom line on this issue is to be selective on the seafood products you consume. The most popular seafood species – shrimp. Lewis, M.J., J.T. Kirschenfeld, T. Goodhart. 2016. 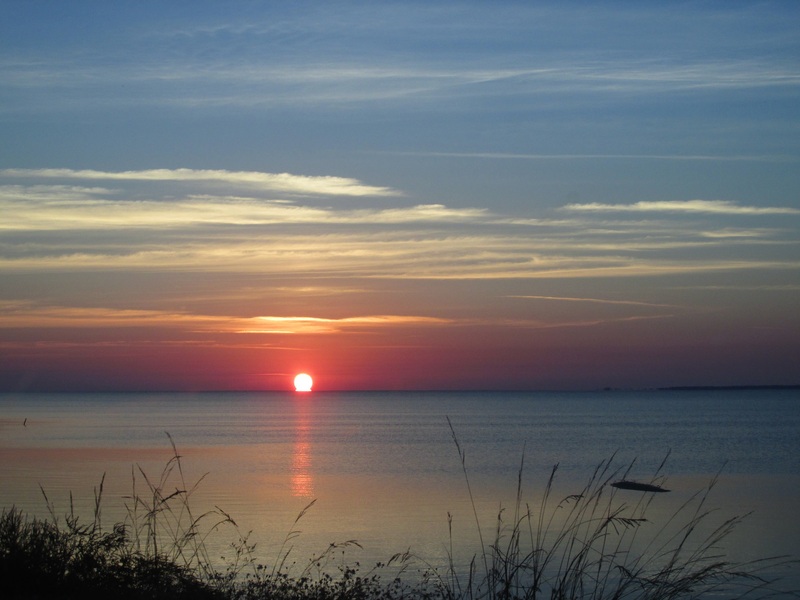 Environmental Quality of the Pensacola Bay System: Retrospective Review for Future Resource Management and Rehabilitation. U.S. Environmental Protection Agency. Gulf Breeze FL. EPA/600/R-16/169.